This entry highlights the cause for the ‘Safari cannot be opened because of a problem’ error messages on Mac and provides an easy fix for this issue. 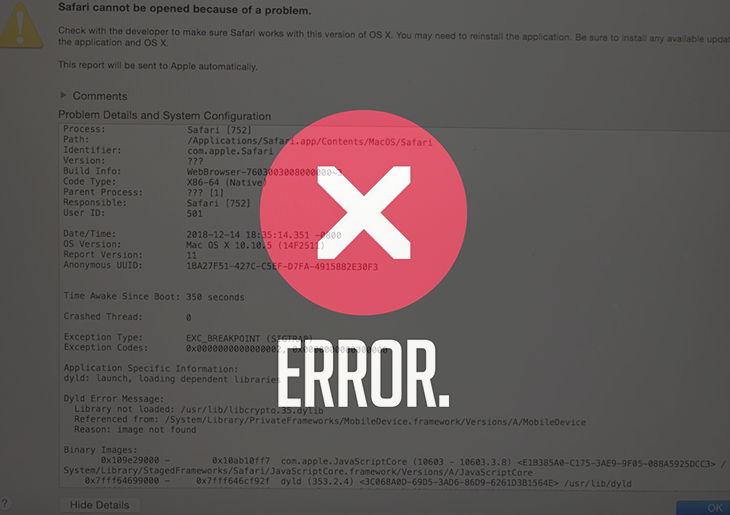 The error report on Mac that says, “Safari cannot be opened because of a problem” is an example of how things may go wrong with software updates. Numerous users have been complaining of being unable to launch and use the Safari web browser since last week, with the above alert accompanying every such futile attempt. These predicaments co-occurred with the release of a new iTunes version (12.8.1) by Apple, which supports operating system builds from OS X Yosemite through macOS High Sierra. A little bit of closer analysis has revealed that this overlapping timeframe wasn’t a coincidence. While delivering a few minor improvements, the update prevents Safari 10.1.2 from opening. At the time of this writing, it’s not entirely clear thus far whether later editions of this Mac-native browser are affected. “Safari cannot be opened because of a problem. Naturally, lots of those affected are at their wit’s end figuring out how an iTunes upgrade could have possibly impacted Safari in such a disruptive fashion. It turns out that the most likely cause for this malfunction is that the release of iTunes 12.8.1 has modified the entity called MobileDevice.framework. It is located in the following path: /System/Library/PrivateFrameworks. The new version of this object may be incompatible with the users’ edition of Safari, hence the problem report and failed attempts to open the browser. At least, this is the most plausible explanation at this point. Most of the affected Mac users have been able to fix the issue by either restoring the MobileDevice.framework item to its pre-update state via the Time Machine backup feature, or by simply dragging it to the Trash altogether. There can be one more reason for the “Safari cannot be opened because of a problem” alerts, though. They may ensue from malware activity on Mac. The culprit can be a malicious Safari extension or plugin that doesn’t work as intended and cripples the browser instead of displaying ads or redirecting the web traffic. It’s also quite likely that the victim could have tried to disable the infection but didn’t go all the way, so its leftovers have broken the browser and continue to cause the irritating errors. No matter which scenario you have encountered – whether it’s the buggy update or the shenanigans of a virus – the steps below will help address the “Safari cannot be opened because of a problem” issue. The steps listed below will walk you through the troubleshooting. Be sure to follow the instructions in the order specified. In case you don’t have a relevant backup or the Time Machine app wasn’t enabled, the only workaround is to delete the current version of the malfunctioning entity. So, spot MobileDevice.framework in the following location: /System/Library/PrivateFrameworks/MobileDevice.framework. Restart Safari and check if it works the way it should. If it does, you should now be good to go. If the “Safari cannot be opened because of a problem” error report is still popping up, proceed to the next section of this guide. When confronted with an issue like the “Safari cannot be opened because of a problem” error report that may be caused by a virus, you can neutralize the toxic impact by leveraging a specially crafted system utility. The Freshmac application (read review) is a perfect match for this purpose as it delivers essential security features along with must-have modules for Mac optimization. This tool cleans unneeded applications and persistent malware in one click. It also protects your privacy by eliminating tracking cookies, frees up disk space, and manages startup apps to decrease boot time. On top of that, it boasts 24/7 tech support. The following steps will walk you through the automatic fix for the issue in question. Download Freshmac installer onto your machine. Double-click the Freshmac.pkg file to trigger the installer window, select the destination disk and click Continue. The system will display a dialog asking for your password to authorize the setup. Type the password and click Install Software. The scan report will then display your current system health status and the number of issues detected for each of the above categories. Click the Fix Safely button tto remove junk files and address privacy issues spotted during the scan. Check whether the “Safari cannot be opened because of a problem” error has been fixed. If it perseveres, go to the Uninstaller option on Freshmac GUI. Locate an entry that appears suspicious, select it and click Fix Safely button to force-uninstall the unwanted application. Go to Temp and Startup Apps panes on theinterface and have all redundant or suspicious items eliminated as well. The potentially unwanted code, if any, shouldn’t be causing any further trouble.